Dealing with expectations is a tricky endeavor for every cook, whether at home or at a four-star restaurant. Granted, the four-star chef has a harder time: diners at a four-star restaurant expect impeccable service, pristine surroundings, and food at the cutting edge of what food can be. At home, things are a little different. 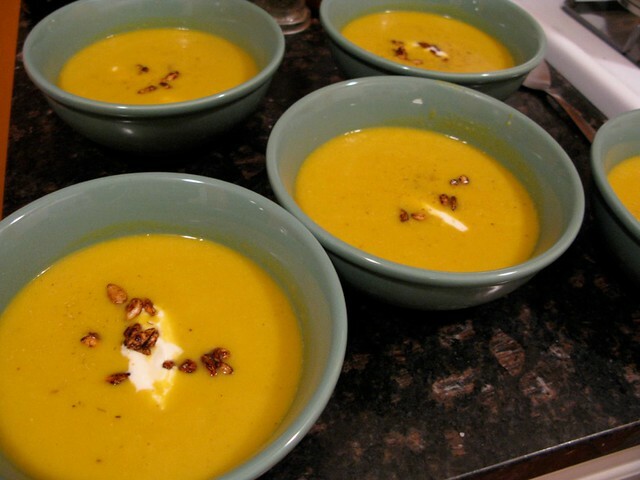 You don’t have to make a streak of sauce on the plate with the back of a spoon, you don’t have to scrape crumbs off the table with a crumb-scraper, but if you’re going to serve something familiar, as I did recently with Butternut Squash Soup, it better be the comfortingly sweet version that everyone knows and loves. Sad to say that this one, which comes from one of my favorite cookbooks ever, Suzanne Goin’s “Sunday Suppers at Lucques,” isn’t. Which is why, I’ve come to believe, that the guests who I served this to on Friday night (these specific guests shall remain nameless) didn’t finish the portions I served them. Granted, I served them two ladlefuls. And granted, there was chicken and cous cous and dessert still to come. Ok, one of the guests, my friend Alex (it was her birthday) told me later that she loved the soup but that her sister and friend Raife (who’s also my friend Raife) weren’t crazy about it. 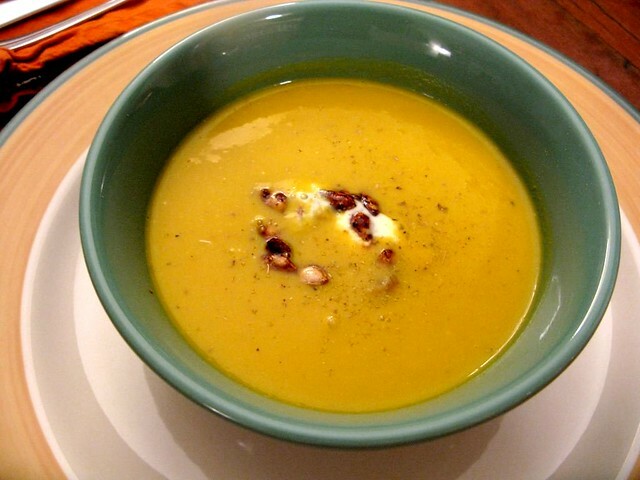 I get that because this soup, which takes a while to make, has the strong presence of fennel which undercuts the sweetness of the squash; and sweet squash is what we expect when we eat a bowl of butternut squash soup. The savory elements are heightened with toasted fennel seeds, dried chilis, bay leaves, and thyme. To tell the truth, fully aware of my guests’ expectations, I tasted the finished soup–which was, indeed, quite savory–and added a few glugs of maple syrup that I bought at the farmer’s market. 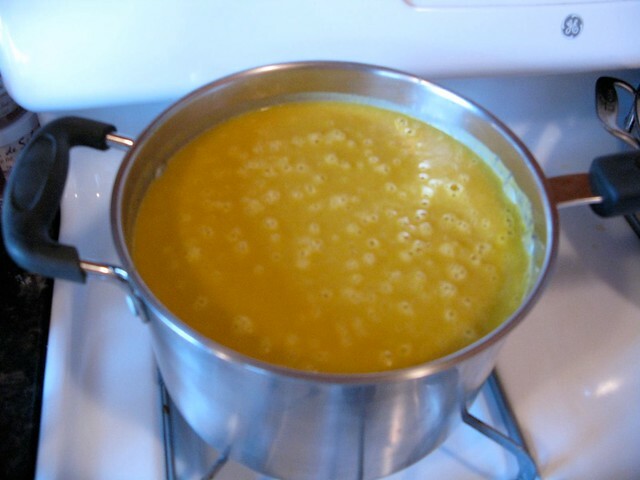 I whisked it in and tasted and it tasted more like the traditional squash soup, but not quite. Again, expectations are tricky things; this soup is the kind of soup that defeats them. For some (Alex, Craig and myself) that’s a good thing; for others (again, they’ll go nameless, LIZZIE AND RAIFE) it’s a deal-breaker. Cut the squash in half lengthwise, and remove the seeds (note: I used the butternut squash seeds to make the candied seeds in the next recipe.) Place the squash cut side down on a cutting board and use a sharp knife to remove the peel. Slice the squash into 1-inch thick wedges. Cut the fennel in half lengthwise and then into 1/4-inch-thick-wedges. Toss the squash and fennel with the olive oil, 1 teaspoon salt, and some freshly ground black pepper. 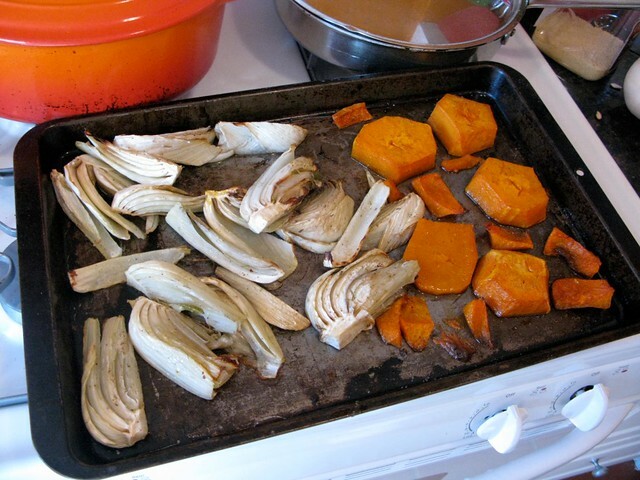 Place the vegetables flat on a baking sheet and roast about 35 minutes, until tender and slightly caramelized. Meanwhile, toast the fennel seeds in a small pan over medium heat 2 to 3 minutes, until the seeds release their aroma and are lightly browned. Pound them coarsely in a mortar. 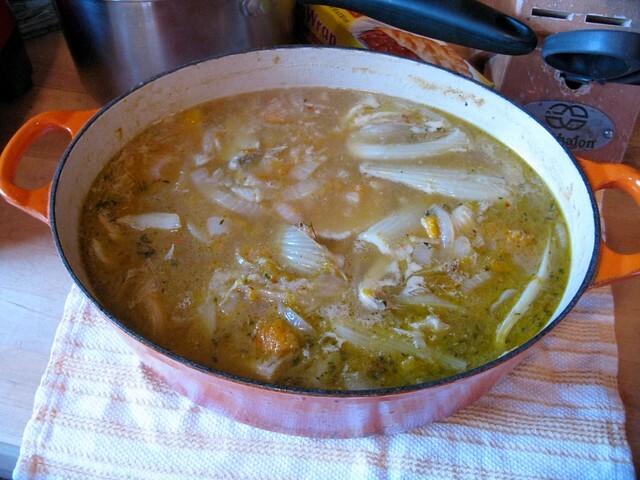 Heat a Dutch oven or soup pot over high heat for 2 minutes. Add the butter, and when it foams, add the onions, fennel seeds, thyme, chiles, bay leaf, 1 teaspoon salt, and a good amount of freshly ground black pepper. 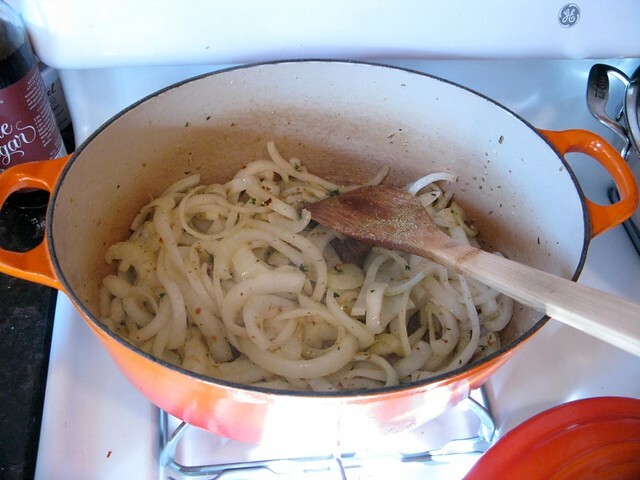 Reduce the heat to medium-high, and cook about 10 minutes, stirring often, until the onions are soft, translucent and starting to color. 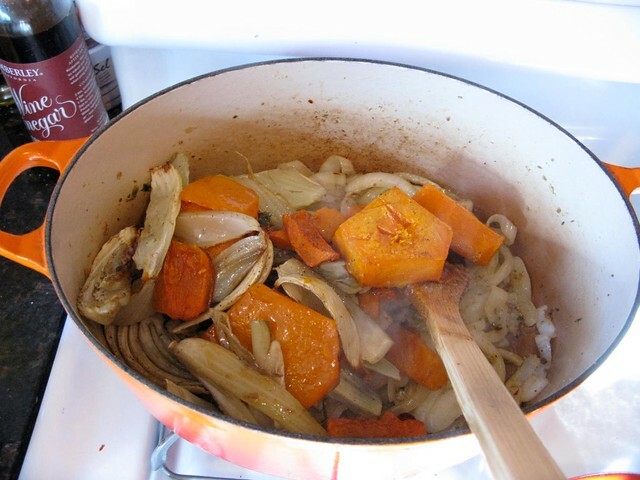 Add the squash and fennel, and stir to coat with the onions for a minute. Turn the heat back up to high and pour in the sherry. [Don’t skip the sherry! It adds great flavor.] Let it reduce for a minute or two, and then add the stock and 1 Tablespoon salt. Bring to a boil, turn down the heat and simmer 20 minutes. Strain the soup in a colander set in a pot. 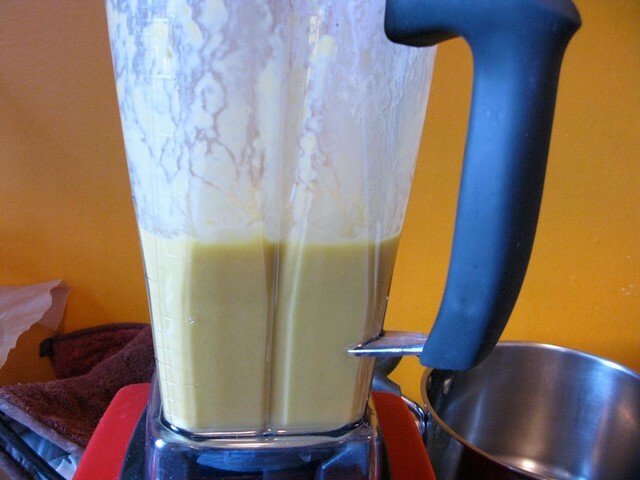 Put a third of the solids into a blender with 1/2 cup of the broth. (You will need to puree the soup in batches.) Process at the lowest speed until the squash mixture is pureed. Add another 1/2 cup broth and then turn the speed up to high and pour in more liquid, a little at a time, until the soup has the consistency of heavy cream. Blend at least a minute on high speed, until the soup is completely smooth and very creamy. Pour the soup into six bowls, spoon some creme fraiche in the center of each and scatter the candied pumpkin seeds over the top. 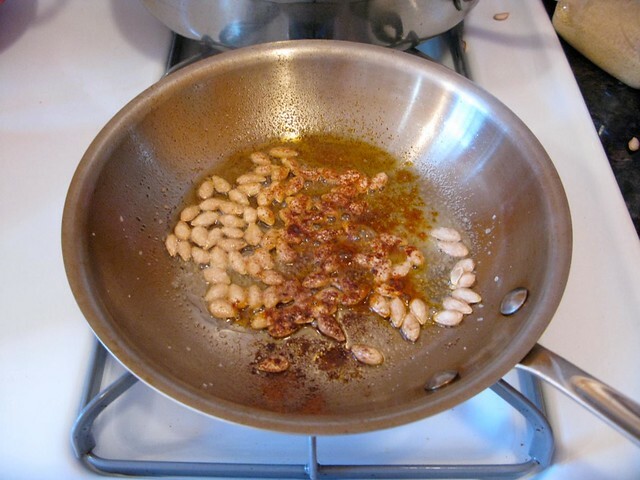 Toast the cumin seeds in a small pan over medium heat 2 to 3 minutes, until the seeds release their aroma and are lightly browned. Pound them coarsely in a mortar. Melt the butter in the cumin pan over medium heat. Add the pumpkin seeds and sugar, then sprinkle the spices and a healthy pinch of salt over them. 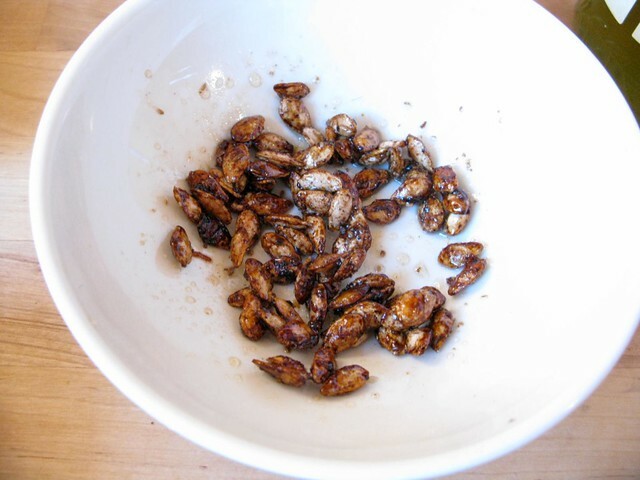 Toss the pumpkin seeds to coat them well with the butter and cook a few minutes, until just after they begin to pop and color slightly. Turn off the heat and wait 30 seconds. Add the honey, tossing well to coat the pumpkin seeds. Spread on a plate and let them cool. And here, once again, the finish, plated soup.